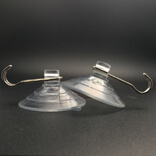 Large suction hooks. 60mm diameter. Thickening. Have you paid attention to the large suction hooks used around your home? Well the chances are no. This is one product category that we use regularly without batting an eyelid. 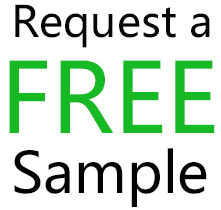 However closer inspection at any home or office will reveal that we use many different variations of this product. A product like the Suction Cups KF- 60BH-A can help us achieve storage at the fraction of cost of a permanent structure. This saves time with regards to installation of such a structure. KingFar has gained a market leadership in this industry due to the fact that they keep experimenting with different materials. 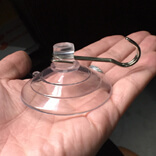 Most companies stick to normal plastic to make these suction cup hooks for wall. However, KingFar has realized that there are other synthetic products that can surpass the strength and performance of normal plastic. Variations in size from the average 20 mm to 8mm to 85mm. Best weight bearing capacity in the industry. Works in various temperature conditions. Can be used in different smooth surfaces. 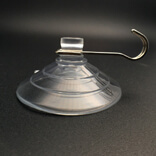 Suction Cup KF- 60BH-A can be used in different conditions with ease. The fact that materials like PVC and Silicone are used for its creation allows it to bear extreme temperatures as low as -20degress or as high as 80 degrees. It has the best load bearing capacity in the industry as compared to any other product in the same category. 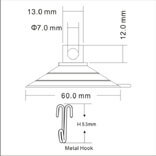 The addition of the metal hook enhances rather than reducing the integrity of the product. This makes it versatile and can be used under any circumstance with relative ease at all times. The product can be found in residential as well as commercial spaces providing a storage capacity as per the requirement of the consumer.